Many fly species favour dark moist locations for laying eggs including body tissues. The vent area of the chicken is the most preferred area for oviposition since the odour emanating from the vent area serves as an attractant for flies. In facultative myiasis, the adult flies are attracted to a moist wound, skin lesion, or soiled feathers with persistent droppings. The eggs are laid on or in the moist punctured skin of the vent area. 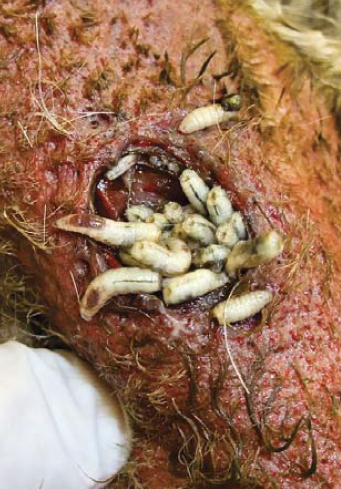 The maggots then begin feeding on the skin tissues causing deep sores which eventually leads to infection popularly called “back end infection”.Apeculiar, distinct, obnoxious odor permeates the infested tissue and the affected bird. Such infested birds become unsaleable and may die from infection, unless the process is halted by appropriate therapy. Occurrences are most common in humid and warm weather where sanitation is poor. Though birds maintain their personal hygiene by grooming themselves, the wet and runny droppings that build ups on their vent feathers make it impossible for the birds to clean. This dropping soiled vent area can cause skin to rupture and be potential spot for ovi position. Improper digestive health is the main reason for wet abnormal droppings. Myiasis has much greater economic impact on broilers as birds get infected generally after three weeks of age. Apart fromcausing more direct distress to birds, the secondarywound infection caused by maggots often results in death leading tomore severe losses to the broiler farmer. Exotic Biosolutions has expertise and experience of providing long term sustainable solutions to flies in caged layer poultry. After an increased understanding of the biology, physiology and ecology of myiasis causing flies, we have come up with an innovative solution to prevent flies in broiler production also, particularly keeping in mind the misuse of prevalent pesticides leading to toxic outcomes. favourable for fly breeding in broiler farms. Firstly, it improves the digestive health and prevents watery dropping. Secondly, it acts as blockers of obnoxious odourous compounds (like ammonia) which attract adult flies for ovi position. Lastly, it ensures dry litter throughout the sheds due to its water absorption and rapid drying properties. The overall effect of using this product is summarized below. 1. 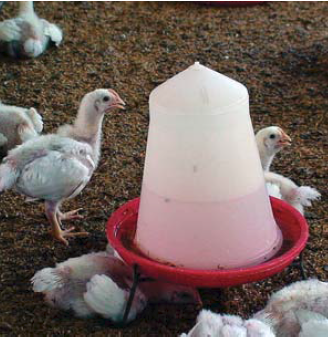 Avoidance of infestation by preventing the adult flies into broiler farms. 2. Suppression or eradication of fly population by denying favourable breeding sites to flies. 3. Dry vent area and less litter soiled rear feathers to prevent myiasis. 2. Keeps vents dry and clean by preventing the accumulation of droppings. Add to starter grade and finisher grade feeds@ 300g. 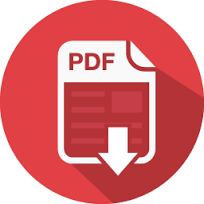 / ton of feed depending upon the climatic conditions and the severity of problem OR as directed by the veterinarians / consultants. For best preventive results, use continuously for all batches in hot and humid weather conditions.